For the record producer, see Tazer (musician). For the punk rock band, see Tazers. For other uses, see Taser (disambiguation). Jack Cover, a NASA researcher, began developing the Taser in 1969. By 1974, Cover had completed the device, which he named after a book featuring his childhood hero, Tom Swift. The book was Tom Swift and His Electric Rifle, by "Victor Appleton" (a house pseudonym of the Stratemeyer Syndicate). The Taser Public Defender used gunpowder as its propellant, which led the Bureau of Alcohol, Tobacco and Firearms to classify it as a firearm in 1976. The backformed verb "to tase" is used sometimes. Taser International CEO Patrick Smith has testified in a Taser-related lawsuit that the catalyst for the development of the device was the "shooting death of two of his high school acquaintances" by a "guy with a legally licensed gun who lost his temper". In 1993, Rick Smith and his brother Thomas began to investigate what they called "safer use of force option[s] for citizens and law enforcement". At their Scottsdale, Arizona, facilities, the brothers worked with the "...original Taser inventor, Jack Cover" to develop a "non-firearm Taser electronic control device". The 1994 Air Taser Model 34000 had an "anti-felon identification (AFID) system" to prevent the likelihood that the device would be used by criminals; upon use, it released many small pieces of paper containing the serial number of the Taser device. The U.S. firearms regulator, the ATF, stated that the Air Taser was not a firearm. In 1999, Taser International developed an "...ergonomically handgun-shaped device called the Advanced Taser M-series systems", which used a "...patented neuromuscular incapacitation (NMI) technology". 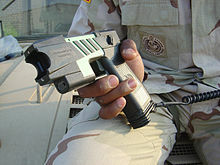 In May 2003, Taser International released a new weapon called the Taser X26, which used "shaped pulse technology". 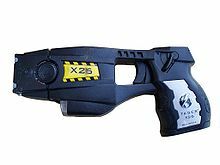 On July 27, 2009 Taser International released a new type of Taser called the X3, which can fire three shots before reloading. It holds three new type cartridges, which are much thinner than the previous model. The Taser fires two small dart-like electrodes, which stay connected to the main unit by conductive wire as they are propelled by small compressed nitrogen charges. The cartridge contains a pair of electrodes and propellant for a single shot (or three shots in the X3 model) and is replaced after each use. There are a number of cartridges designated by range, with the maximum at 35 feet (10.6 m). Cartridges available to non-law enforcement consumers are limited to 15 feet (4.5 m). The electrodes are pointed to penetrate clothing and barbed to prevent removal once in place. Earlier Taser models had difficulty in penetrating thick clothing, but newer versions (X26, C2) use a "shaped pulse" that increases effectiveness in the presence of barriers. Tasers may provide a safety benefit to police officers. Tasers have a greater deployment range than batons, pepper spray or empty hand techniques. This allows police to maintain a greater distance. A study of use-of-force incidents by the Calgary Police Service conducted by the Canadian Police Research Centre found that the use of Tasers resulted in fewer injuries than the use of batons or empty hand techniques. The study found that only pepper spray was a safer intervention option. The TASER device is a less-lethal, not non-lethal, weapon. Sharp metal projectiles and electricity are in use, so misuse or abuse of the weapon increases the likelihood that serious injury or death may occur. In addition, the manufacturer has identified other risk factors that may increase the risks of use. Children, pregnant women, the elderly, and very thin individuals are considered at higher risk. Persons with known medical problems, such as heart disease, history of seizure, or have a pacemaker are also of greater risk. Axon also warns that repeated, extended, or continuous exposures to the weapon are not safe. Because of this, the Police Executive Research Forum believes that a total exposure should not exceed 15 seconds. Some Taser models, particularly those used by police departments, also have a "Drive Stun" capability, where the Taser is held against the target without firing the projectiles, and is intended to cause pain without incapacitating the target. "Drive Stun" is "the process of using the EMD (Electro Muscular Disruption) weapon [Taser] as a pain compliance technique. This is done by activating the Taser and placing it against an individual's body. This can be done without an air cartridge in place or after an air cartridge has been deployed." Guidelines released in 2011 in the U.S. recommend that use of Drive Stun as a pain compliance technique be avoided. The guidelines were issued by a joint committee of the Police Executive Research Forum and the U.S. Department of Justice Office of Community Oriented Policing Services. The guidelines state "Using the ECW to achieve pain compliance may have limited effectiveness and, when used repeatedly, may even exacerbate the situation by inducing rage in the subject". A study of U.S. police and sheriff departments found that 29.6% of the jurisdictions allowed the use of Drive Stun for gaining compliance in a passive resistance arrest scenario, with no physical contact between the officer and the subject. For a scenario that also includes non-violent physical contact, this number is 65.2%. A Las Vegas police document says "The Drive Stun causes significant localized pain in the area touched by the Taser, but does not have a significant effect on the central nervous system. The Drive Stun does not incapacitate a subject but may assist in taking a subject into custody." The UCLA Taser incident and the University of Florida Taser incident involved university police officers using their Taser's "Drive Stun" capability (referred to as a "contact tase" in the University of Florida Offense Report). Amnesty International has expressed particular concern about Drive Stun, noting that "the potential to use Tasers in drive-stun mode—where they are used as 'pain compliance' tools when individuals are already effectively in custody—and the capacity to inflict multiple and prolonged shocks, renders the weapons inherently open to abuse". Taser currently has a total of 5 models of electroshock weapons for sale. Taser currently has two taser models for sale for law enforcement. They are the single shot Taser X26P and the two shot Taser X2. Both Tasers have a civilian model available. Both Tasers have contact stun mode. Both Tasers have an optional camera battery pack. Taser currently has three self-defense weapons for sale. They are Taser Pulse, Taser Strikelight, and Taser Bolt. Other models still in circulation include the Taser M26 (still used by a number of law enforcement agencies), the Taser C2 (updated Taser Bolt) and the Taser X3 which was first introduced in 2009. In recent years[when?] there have been numerous advances in both the technology that powers Tasers as well as the size, look and feel of each particular model. Three of the more notable advancements were introduced in the TASER X2 Defender which debuted in 2011. The three improvements are the "back up shot" feature, dual lasers, and the warning arc. With the option for an additional shot, the X2 provides a benefit that other models cannot, the chance for a second shot without having to reload. The dual lasers are the latest material advance in Tasers, greatly increasing the accuracy and thus the likelihood of hitting the intended target. The user can see exactly where the probes will deploy as the lasers pinpoint where each probe will contact the intended target. The warning arc has had perhaps the biggest impact of all the improvements, as it permits the user to deescalate the situation without firing the Taser. According to Kevin Sailor of the Westminster Police Department, "All of our initial field uses of the X2 resulted in voluntary surrenders upon display of the warning arc." Each of the innovations mentioned in this article and others unmentioned have led two models – the Taser X26P and the Taser X2 – to be called "smart weapons". Other advances include increased processing speeds, improved chip and circuitry technologies, and more powerful software. There are several accessories available with which to outfit newer Taser models. From small accessories used in conjunction with a Taser such as practice targets, maintenance kits, a data port download kit, and the Blackhawk® holster, there are also accessories that are interchangeable with the stock setup of a Taser (factory setup as you would receive it from an authorized Taser dealer). These accessories allow for a customizable weapon to meet the specialized needs of a particular agency or an individual user. Examples are the many power magazines available (battery types) and the Taser CAM HD. The Taser CAM HD is a specialized device designed to capture audio and video without the need to manually turn on the recording device, an action that is unpractical in the field. "Automatically capturing video and audio unburdens the user from the need to manually turn on the device during a dangerous situation. This is critical and guarantees there will always be a record of the TASER firing." Designed to be interchangeable between the Taser X26 or Taser X2, the camera records both video and audio automatically each time the Taser is armed (when the safety is moved into the up or active position). There is no interference to the normal function of the Taser; it is still fully functional while the camera is in operation. This innovation coupled with the data port download kit allows for the automatic archiving of critical events for law enforcement agencies. According to a 2010 study titled "Police Use of Force, Tasers and Other Less-Lethal Weapons", over 15,000 law enforcement and military agencies around the world use Tasers as part of their use of force continuum. The study was conducted by the United States Department of Justice. Just as the number of agencies deploying Tasers has continued to increase each year, so too the number of Taser related "incidents" between law enforcement officers and suspects has been on the rise. Although there has been a history of controversy regarding the ethical use of Tasers, studies similar to the one conducted by the U.S. Department of Justice have shown Taser use actually provides many positive benefits to police officers and even to the suspects they encounter. A study of the Houston Police Department found the number of workers comp claims by officers has declined by as much as 93% due to deploying Tasers as a means of non lethal force. Suspect injuries have also been impacted by Taser use, trimming the percentage of suspect injuries by as much as 60%. Another study conducted in 2009 by Wake Forest University confirmed data from the Houston study. The Wake Forest study found 99.75% of suspects who had been subjected to Taser use had no significant injuries. Use of Tasers by the Seattle Police Department, one of the largest police forces in the Northwestern United States, has been shown to reduce the odds of suspect injury by 48%. Data gathered from other agencies confirms a decline in suspect injuries due to Taser deployment. In Orlando, Florida and Austin, Texas, studies found that suspect injuries were 50% and 30% lower respectively after Taser use was adopted. Officer injuries have been impacted by Taser use as well. The same studies found that in most agencies officer injuries were greatly reduced after Taser's were introduced as part of each particular organizations use of force continuum. Although more recent studies have uncovered vast amounts of data that supports the positive benefits of Taser usage in law enforcement, there is also data that suggests Taser usage has negatively impacted some individual police officers as well. The study conducted in 2010 by the United States Department of Justice found that some officers may rely too heavily upon activating (deploying) a Taser during suspect encounters. The study refers to this negative trait in some police officers as "lazy cop" syndrome. Further research is being conducted to determine what triggers some officers to rely too heavily upon Taser use or deploy a Taser too early in an encounter. As the technology continues to evolve, Tasers are becoming more advanced "smart weapons." The officers and agencies who deploy them have opportunities to receive specialized training to hone their skills at deploying these emerging technologies. Taser International offers law enforcement agencies around the world the opportunity to receive hands on training in their training academy, led by some of the world's leading Taser experts. The Taser® Training Academy offers courses including training in Taser tactics, weapon maintenance, data reporting, and "smart use" training. In another related field advancement, Noel Sharkey reported in the Wall Street Journal (December 2015) that police in North Dakota have been cleared to operate drone aircraft equipped with tear gas and Tasers. Some of the deaths associated with Tasers are given a diagnosis of excited delirium, a term for a phenomenon that manifests as a combination of delirium, psychomotor agitation, anxiety, hallucinations, speech disturbances, disorientation, violent and bizarre behavior, insensitivity to pain, elevated body temperature, and increased strength. Excited delirium is associated with sudden death (usually via cardiac or respiratory arrest) particularly following the use of physical control measures, including police restraint and Tasers. Excited delirium most commonly arises in male subjects with a history of serious mental illness and/or acute or chronic drug abuse, particularly stimulant drugs such as cocaine. Alcohol withdrawal or head trauma may also contribute to the condition. The diagnosis of excited delirium has been controversial. Excited delirium has been listed as a cause of death by some medical examiners for several years, mainly as a diagnosis of exclusion established on autopsy. Additionally, academic discussion of excited delirium has been largely confined to forensic science literature, providing limited documentation about patients that survive the condition. These circumstances have led some civil liberties groups to question the cause of death diagnosis, claiming that excited delirium has been used to "excuse and exonerate" law enforcement authorities following the death of detained subjects, a possible "conspiracy or cover-up for brutality" when restraining agitated individuals. Also contributing to the controversy is the role of Taser use in excited delirium deaths. Excited delirium is not found in the current version of the Diagnostic and Statistical Manual of Mental Disorders, however the term "excited delirium" has been accepted by the National Association of Medical Examiners and the American College of Emergency Physicians, who argued in a 2009 white paper that "excited delirium" may be described by several codes within the ICD-9. The American College of Emergency Physicians "rejects the theory" that excited delirium is an "invented syndrome" used to excuse or cover-up the use of excessive force by law enforcement. There has been considerable controversy over the use of tasers on children and in schools. In 2004, the parents of a 6-year-old boy in Miami sued the police department for firing a Taser at their child. The police said the boy was threatening to injure his own leg with a shard of glass, and said that using the device was the safest option to prevent the boy from injuring himself. Nevertheless, the boy's mother told CNN that the three officers involved probably found it easier not to reason with her child. Also in 2004, a 12-year-old girl skipping school and drinking alcohol was Tasered in Miami-Dade while she was running from police and started to run into traffic. The Taser was successfully deployed to stop her from being hit by cars or causing an automobile accident. In March 2008, an 11-year-old girl was subdued with a Taser. In March 2009, a 15-year-old boy died from alcohol-induced excited delirium in Michigan after being Tasered. Police use Tasers on smaller subjects and elderly subjects since striking them or falling on them will cause much more injury than a Taser which only contracts their muscles that are conditioned for their size and it is extremely rare for a person to break their own bones by contracting muscles. Critics counter that Tasers may interact with pre-existing medical complications such as medications, and may even contribute to someone's death as a result. Critics also suggest that using a Taser on a minor, particularly a young child, is effectively cruel and abusive punishment, or unnecessary. A report from a meeting of the United Nations Committee Against Torture states that "The Committee was worried that the use of Taser X26 weapons, provoking extreme pain, constituted a form of torture, and that in certain cases it could also cause death, as shown by several reliable studies and by certain cases that had happened after practical use." Amnesty International has also raised extensive concerns about the use of other electro-shock devices by American police and in American prisons, as they can be (and according to Amnesty International, sometimes are) used to inflict cruel pain on individuals. Maurice Cunningham of South Carolina, while an inmate at the Lancaster County Detention Center, was subjected to continuous shock for 2 minutes 49 seconds, which a medical examiner said caused cardiac arrhythmia and his subsequent death. He was 29 years old and had no alcohol or drugs in his system. In response to the claims that the pain inflicted by the use of the Taser could potentially constitute torture, Tom Smith, the Chairman of the Taser Board, has stated that the U.N. is "out of touch" with the needs of modern policing and asserted that "Pepper spray goes on for hours and hours, hitting someone with a baton breaks limbs, shooting someone with a firearm causes permanent damage, even punching and kicking—the intent of those tools is to inflict pain, ... with the Taser, the intent is not to inflict pain; it's to end the confrontation. When it's over, it's over. Tom Swift and His War Tank, also by "Victor Appleton"
^ Taylor, Bruce (September 2009). "Comparing safety outcomes in police use-of-force cases for law enforcement agencies that have deployed Conducted Energy Devices and a matched comparison group that have not: A quasi-experimental evaluation" (PDF). National Institute of Justice. ^ Roberts, Daniel. "A new life for Taser, this time with less controversy". Fortune. Retrieved September 14, 2011. ^ a b "TASER CEW Use Guidelines" (PDF). Axon. April 5, 2017. Retrieved January 3, 2019. ^ Langton, Jerry (December 1, 2007). "The dark lure of `pain compliance'". Toronto Star. Retrieved December 1, 2007. ^ "Jack Cover: Inventor of the Taser stun gun". ^ Talvi, Silja J. A. (November 13, 2006). "Stunning Revelations". In These Times. Retrieved December 17, 2006. ^ "Jurisdiction over the Taser Public Defender (#236)" (PDF). U.S. Consumer Product Safety Commission. March 22, 1976. Archived from the original (PDF) on September 10, 2008. Retrieved July 23, 2008. ^ "Taser chief gives jurors demonstration of stun-gun blast in court". CourtTV.com. Archived from the original on January 9, 2009. Retrieved October 14, 2009. ^ "Corporate History". Taser.com. February 5, 2007. Archived from the original on September 29, 2009. Retrieved October 14, 2009. ^ Personal Defense Products: TASER® X26c™ Archived February 8, 2015, at the Wayback Machine, TASER site. Retrieved July 16, 2013. ^ a b TASER® Cartridges: Replacement Cartridge for X26, M26, X2 & X3 Archived March 28, 2015, at the Wayback Machine, TASER site. Retrieved July 16, 2013. ^ TASER Cartridges (Consumers) Archived September 2, 2009, at the Wayback Machine, TASER site. Retrieved December 15, 2007. ^ "Shaped Pulse Technology". Taser International. April 27, 2007. Archived from the original on May 26, 2007. Retrieved March 29, 2009. ^ "Police batons more dangerous than Tasers: Study". Archived from the original on January 5, 2016. ^ Lee, Timothy (November 14, 2017). "Family of man who dies after Taser incident gets $5.5 million verdict". Retrieved January 3, 2019. ^ Law Enforcement Advisory Committee (Summer 2005). "Less Lethal Weapons: Model Policy and Procedure for Public Safety Officers" (PDF). Michigan Municipal Risk Management Authority. Archived from the original (PDF) on August 20, 2008. Retrieved May 12, 2009. ^ A Joint Project of PERF and COPS (April 2011). "2011 Electronic Control Weapon Guidelines". United States Department of Justice. Archived from the original (PDF) on October 17, 2011. Retrieved October 7, 2011. ^ Merrick Bobb; Matthew Barge; Camelia Naguib (August 2007). "A Bad Night at Powell Library: The Events of November 14, 2006" (PDF). Police Assessment Resource Center. Retrieved April 14, 2016. ^ "University of Florida Police Department offense report" (PDF). CNN. October 18, 2007. Retrieved April 14, 2016. ^ "Amnesty International's concerns about Tasers". Amnesty.ca. Archived from the original on July 17, 2009. Retrieved October 14, 2009. ^ "TASER X2 – Advancements in Taser Technologies". Taser X2 Smart Weapons Review. June 5, 2016. Retrieved June 6, 2016. ^ "New Taser Can Shock 3 People Without Reload: Special Coverage: Stun Guns at". Officer.com. July 28, 2009. Archived from the original on August 2, 2009. Retrieved October 14, 2009. ^ "Spotlight: Taser HD Cam". ArmorandShieldTech.com. Archived from the original on July 5, 2018. Retrieved June 7, 2016. ^ "Training, Courses, Practical Knowledge". TASER. Retrieved June 20, 2016. ^ a b Grant JR, Southall PE, Mealey J, Scott SR, Fowler DR (March 2009). "Excited delirium deaths in custody: past and present". Am J Forensic Med Pathol. 30 (1): 1–5. doi:10.1097/PAF.0b013e31818738a0. PMID 19237843. ^ a b Ruth SoRelle (October 2010). "ExDS Protocol Puts Clout in EMS Hands". Emergency Medicine News. 32 (10): 1, 32. doi:10.1097/01.EEM.0000389817.48608.e4. ^ Samuel E, Williams RB, Ferrell RB (2009). "Excited delirium: Consideration of selected medical and psychiatric issues". Neuropsychiatr Dis Treat. 5: 61–6. doi:10.2147/ndt.s2883. PMC 2695211. PMID 19557101. ^ a b "Death by Excited Delirium: Diagnosis or Coverup?". NPR. Retrieved February 26, 2007. You may not have heard of it, but police departments and medical examiners are using a new term to explain why some people suddenly die in police custody. It's a controversial diagnosis called excited delirium. But the question for many civil liberties groups is, does it really exist? ^ a b "Excited Delirium: Police Brutality vs. Sheer Insanity". ABC News. March 2, 2007. Retrieved March 13, 2007. Police and defense attorneys are squaring off over a medical condition so rare and controversial it can't be found in any medical dictionary—excited delirium. Victims share a host of symptoms and similarities. They tend to be overweight males, high on drugs, and display extremely erratic and violent behavior. But victims also share something else in common. The disorder seems to manifest itself when people are under stress, particularly when in police custody, and is often diagnosed only after the victims die. ^ "Suspects' deaths blamed on 'excited delirium', critics dispute rare syndrome usually diagnosed when police are involved". Associated Press at MSNBC. Retrieved April 29, 2007. Excited delirium is defined as a condition in which the heart races wildly—often because of drug use or mental illness—and finally gives out. Medical examiners nationwide are increasingly citing the condition when suspects die in police custody. But some doctors say the rare syndrome is being overdiagnosed, and some civil rights groups question whether it exists at all. ^ "Tasers Implicated in Excited Delirium Deaths". NPR. Retrieved April 29, 2007. The medical diagnosis called excited delirium is the subject of intense debate among doctors, law-enforcement officers and civil libertarians. They don't even all agree on whether the condition exists. But to Senior Cpl. Herb Cotner of the Dallas Police Department, there's no question that it's real. ^ Mark L. DeBard, MD (November 2009). "Identifying New Disease as Excited Delirium Syndrome Rejects Idea that Police Brutality Causes Deaths". Emergency Medicine News. 31 (11): 3, 5. doi:10.1097/01.EEM.0000340950.69012.8d. The report has some political implications, too, because it rejects the theory that ExDS is an invented syndrome being used to cover up or excuse the use of force or even brutality by law enforcement officers when someone dies in their custody. It rejects the idea that specific forms of restraint in and of themselves are what cause deaths in ExDS patients. Instead, ExDS is a potentially fatal disease in which all forms of physiologic stress, from physical and noxious chemical to electrical conductive weapons (commonly called TASERs), can tip the balance of a condition on the edge of being fatal. It recognizes that some form of the use of force is often necessary to control agitation in the face of delirium, but that it should be the minimal amount necessary to achieve patient control and ensure public safety, and be followed immediately by medical intervention. ^ "Officials: Deputy Shocks Girl, 11, With Taser At Elementary School". Local6.com. March 27, 2008. Archived from the original on December 11, 2008. Retrieved October 14, 2009. ^ "Judge awards $1 million in Brett Elder wrongful death suit against Bay City, police". ^ Associated Press (March 23, 2009). "Michigan 15-year-old Dies After Police Tase Him". Cbsnews.com. Retrieved October 14, 2009. ^ "More UK police to get stun guns". BBC News. May 16, 2007. Retrieved November 17, 2011. ^ "Tasers a form of torture, says UN". The Daily Telegraph (Sydney). AFP. November 24, 2007. Retrieved November 17, 2011. ^ "Taser Blamed for Inmate's Death". United Press International. September 28, 2005. Retrieved November 8, 2008. ^ "Officers used tasers, baton on inmate". Associated Press. July 28, 2005. Archived from the original on November 6, 2009. Retrieved November 8, 2008. ^ "UN 'out of touch' on torture: Taser boss". Australian Broadcasting Corporation. November 28, 2007. Retrieved June 12, 2008.